Anna Lyles (Rosaline) is an actor, musician, and painter from Florence, South Carolina. She most recently produced and performed as Yitzhak in Hedwig and the Angry Inch at Toy Boat Community Arts Space in October of 2017. 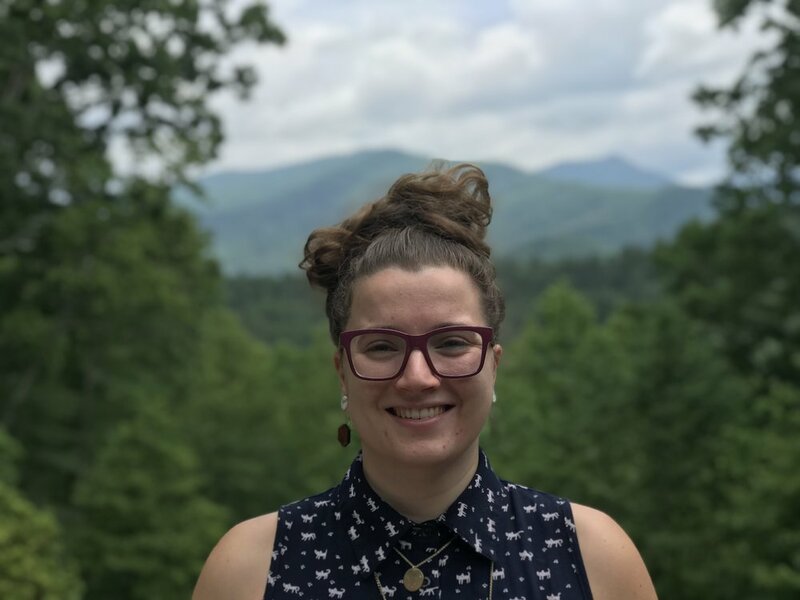 She is highly passionate about collaborating with other artists in the Asheville area, and she is thrilled to be working with The American Myth Center. Carter Bostwick (Juliet) is very excited to be working in the Asheville theater community! Carter grew up with San Francisco’s American Conservatory Theatre and earned a BFA in Theatre Performance from Chapman University. After a year traveling, working, and teaching this is her first season back on the stage—and her first time performing on the east coast! Her stage credits include Spring Awakening, Rent, Merchant of Venice, and The Importance of Being Earnest. Thanks to all the awesome friends in Asheville who have supported Carter’s journey in the mountains! Charlie Wilson (Prince, Apothecary) is delighted to be making his debut with American Myth Center. Recent credits include ZOMBIE PROM with HAYWOOD ARTS REGIONAL THEATRE (HART), ALL IS CALM: The Christmas Truce of 1914 with NC STAGE COMPANY, and the upcoming production of PETE AND PICKLES for ASHEVILLE CREATIVE ARTS. He also recently CONTRIBUTED TO A LOCAL FILM. He is a 6 year performer with ASHEVILLE SYMPHONY CHORUS and a former performer/producer for independent pro-wrestling promotion SUDDEN THRILL WRESTLING of Haywood County from 2010-2016. When he is not performing, he is an Online Service Coordinator for Waynesville Automotive. Claudia Sturgell (Understudy) - is proud to be working with AMC for the first time. Some of her previous roles include Hermia in A Midsummer Nights Dream, and Margaret in Sense and Sensibility. She is an activist and avid reader, and is excited to have the opportunity to be a part of such a unique production. Daniel Henry (Tybalt & Paris) is excited to be part of this wonderful production! After graduating from Mars Hill University in 2016 with a bachelor's degree in Theatre Arts, he moved to Charlotte to pursue a career in acting. After a brief time in Charlotte, he decided to move back to Asheville. Here he has been seen in The Alabama Story (Thomas), and Othello (Montano) with Different Strokes. He wants to thank his family and his friends for being supportive in all that he does. Thank you for coming and enjoy the show! Jane Hallstrom (Lady Capulet & Lady Montague) is a frequent performer in the Asheville area theater scene with companies such as Montford Park Players, Parkway Playhouse, Attic Salt, The Magnetic, and Mountain Arts Theatre. Favorite roles include Feste in Twelfth Night, Arlene in Baby, Linda in Death of a Salesman, Sonia in Vanya, Sonia, Masha, and Spike, Volumnia in Coriolanus, and the Duchess of Gloucester in Richard II (with Utah Shakespeare Festival). She sings with the Asheville Symphony Chorus and plays the dulcimer with the Merry Minstrels. She loves spending time with her family, studying and teaching the gospel, seeing movies, attending plays and concerts, and reading. Jeff Untz (Capulet & Montague) is excited and grateful to be in the cast of "The Ballad of R&J". Stage credits include “Amadeus” (Salieri), “1776” (James Wilson), “Wonder of the World” (Captain Mike), “Mister Roberts” (Dolan), and “Right You Are If You Think You Are” (Signor Ponza). Jeff enjoys running, hiking, cycling - is an avid P90X3 enthusiast, a True Blue Tarheel basketball fan, a die-hard member of Raider Nation and roots for the Evil Empire - Go Yanks! He happily shares his life with Carolyn, his wife of 8 years and resides in the beautiful city of Asheville. Ryan Patrick Miller (Understudy) is a student at UNCA and an actor in the Asheville community. He is excited to join the cast of The Ballad of R&J! Previous credits include Rapunzel's Prince (Into the Woods), Joe Pitt (Angels in America: Millennium Approaches), Jean Paul Marat (MARAT/SADE), and Lucientio (Taming of the Shrew). He'd like to thank the amazing creative team and cast behind this production! Shawn Morgenlander (Romeo) is originally from Durham, NC. She studied theatre and Spanish at Northwestern University, then furthered her creative education and experience in Chicago. She has performed in touring repertory with the National Players and the Adirondack Shakespeare Company and worked as an actor and theatre educator with Burning Coal Theatre in Raleigh. Life is But a Dream, her original translation/adaptation of La vida es sueño by Pedro Calderón de la Barca, premiered with Spicy Witch Productions in NYC this April. Sonia D’Andrea (Benvolio/Nurse) is an Asheville native. Sonia has been performing in local theatre for over a decade. She has been previously seen with Different Strokes in Alabama Story, Othello, and The Clean House, and with the Montford Park Players in The Importance of Being Earnest, Troilus and Cressida, The Taming Of The Shrew, Timon of Athens, Othello, Coriolanus, Richard II, Much Ado About Nothing, Antony and Cleopatra, Love's Labors Lost and Cyrano de Bergerac. When not onstage Sonia is an avid singer, cat lover and amateur cook. Thank you so much for being here; enjoy the show! Aaron Snook (Adaptor/Director) is a North Carolina native who, prior to moving back to his home state, spent 14 years as a theatre artist in Chicago. With a BA from Duke University in Drama and English and an MFA from Northwestern University in Theatre Directing, Aaron founded the AMC in 2016. Love and gratitude to Simone and Matilda. Elizabeth Bagby (Music Composer/ Music Director/Petra) is a Chicago-based musician, actor, and writer. She is a company member of Strange Tree Group and served as composer and music director for their Three Faces of Dr. Crippen (Steppenwolf Garage, 2011; Best of NY Fringe, 2014) and Shakespeare's King Phycus. Also with Strange Tree: The Dead Prince, Goodbye Cruel World, The War Plays, The Spirit Play, Hey! Mr. Spaceman!, The Mysterious Elephant. Elsewhere in Chicago: ACES, The Next Thing, Accidental Death of an Anarchist (Signal); Julius Caesar, Anne Frank, A Christmas Carol (GreatWorks); The Illusion, Chalk, The Designated Mourner, The Castle (Right Brain); People We Know, Dead Children (the side project); All Hallows, Matawan (Ruckus); and many others. As an arranger/composer: Ballad of the Sad Café (Signal); The Dancing Plague, Chalk (Right Brain); Tuxedo Love (Theatre 5.2.1); Echo (Art of Adaptation festival). TV/film: Chicago Fire, Resurrection Mary. Her writing has appeared in numerous publications and on stage with Sansculottes (Practical Anatomy) and Strange Tree (The Half-Brothers Mendelssohn); her farce Quartet and Fugue won the Mountain Playhouse International Playwriting Award and was shortlisted for the Reva Shiner Comedy Award. In 2014, she was part of a small group of international artists to take part in the Arctic Circle Arts Expedition, exploring the fjords and glaciers of Svalbard aboard a tall-mast ship. Bagby is the frontwoman for Liz + the Baguettes and plays bass for the Unswept and the Regrets. Caitlin McLeod (Costume Designer) is ecstatic to bring this story to life in Asheville, with the American Myth Center. Caitlin is a costume and scenic designer, puppet enthusiast, traveler, and dreamer. Most recent credits include: The Great God Pan (Chicago Fringe Opera), Chicago, Men on Boats (Hollins University), Seussical (Drury Lane), Stellaluna (Northbrook Theatre) , Beauty’s Daughter (American Blues Theatre), along with many assistant credits (Marriott, Drury Lane, Lookingglass Theatre). She is also a co-founder of the Chicago based costume crafts business Craftiga. Outside her work in traditional theatre, Caitlin utilizes art as a catalyst to break the mundane through street art, performance art, and toy theatre. She earned her MFA at Northwestern University. John O’Neil (Stage Manager) is excited to be a part of The Ballad of R & J with American Myth Center! A 2016 graduate from the University of North Carolina at Asheville with a Bachelors in Drama where he focused on design and stage management, John has most recently stage managed “Into the Woods” and “The Sunset Limited” in rep with Theatre UNCA. John’s other stage management credits include “Scrooge No More” at Busch Gardens Williamsburg and “Twilight: Los Angeles, 1992” with Theatre UNCA. When not doing theatre, his job is to show middle school students UNC Asheville as the Junior Bulldog Program Coordinator with the Pre-College Outreach department of Admissions and Financial Aid. John wants to thank Aaron for this opportunity, his cast for their love, and his family and friends for their continued support. Simone Roos Snook (Dialect Coach) is a Co-Founder of the American Myth Center, where she played the Tour Guide in their inaugural production of An Appalachian Christmas Carol. As a member of Signal Ensemble Theatre in Chicago, Simone’s many roles include May in Fool for Love, Miss Amelia in The Ballad of the Sad Cafe, Anita Pallenberg in Aftermath, Samantha Martin in Aces, Jennifer in Hostage Song, Daphne in Lascivious Something, and Elena in Butcher. Other Chicago credits include Dancing at Lughnasa with the Irish Theatre of Chicago, Noises Off! and The Melville Boys with Buffalo Theatre Ensemble, Hamlet and A Midsummer Night’s Dream with First Folio Shakespeare Festival, Hunger with Lifeline Theatre, and Escanaba in Love and Design for Living with Circle Theatre, the latter for which she was nominated for a non-Equity Jeff award. Simone studied theatre at Goldsmiths College at the University of London and earned her BFA in Theatre Arts from Illinois Wesleyan University. She also studied improv and writing at Second City and is a graduate of the Black Box Academy. Many thanks to her family and friends for their ongoing support, and especially to Aaron and Matilda. Alex Smith (Show Truck Co-Designer and Builder) is a graduate of UNCA, where he accidentally began working in the Asheville theater community. He’s had the privilege of working with The Magnetic Theatre, ACA, DSPAC!, and AMC in various roles and looks forward to continuing these wonderful relationships. He’s currently the technical director for DSPAC! and developing his own craft in wood and metal. The American Myth Center would like to thank the following fine folk for this production: Garry and Sharon Snook, Stephanie Hickling Beckman, Michelle Carello, Jon Fillman, Dana Frankel, Janelle Wienke and the rest of the Asheville Area Arts Council, the Awesome Foundation, Morgan Markowitz, Allie Marshall, and the many donors to the Show Truck GoFundMe campaign. The AMC would also like to thank all those involved in the previous workshops at Oregon Shakespeare Festival and Chicago, including the Midnight program at OSF and the City of Chicago's Department of Cultural Affairs and Special Events. Finally, a super special thanks to Jessica Thebus and Michael Rohd whose mentorship made the AMC possible.